Increase Leads & Sales Today From Your Existing Marketing Efforts By Offering High Perceived Value Incentives To Your Customers! 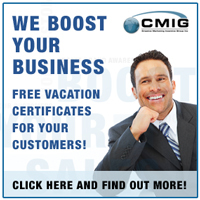 VACATION CERTIFICATES – 7 Night Hotels, Cruises & Airfares – Up To $3000.00 Retail Value Your Customers Just Pay Taxes! DINING CERTIFICATES – $25-$300 Retail Value Thousands Of Restaurants Nationwide! Incentive Marketing Plan was created to bring in more customers with the use of our incentives and plugs right into your existing business model in 4 major areas: advertising, sales, repeat business, and referral business. Run incentive marketing campaigns in all 4 areas, over a 6 – 12 month period and you will notice a nice increase in sales. Get a “.com” and you can have a name to remember before some else claims your corner of the Web. It can give you confidence, trust and recognition. Building your own website is easier than you think with our point, click and design feature. Powered by GoDaddy 24/7 service that’s second-to-none. Each & every domain name comes with all you need to get online right now. Big savings over the competition with a list of FREE extras.